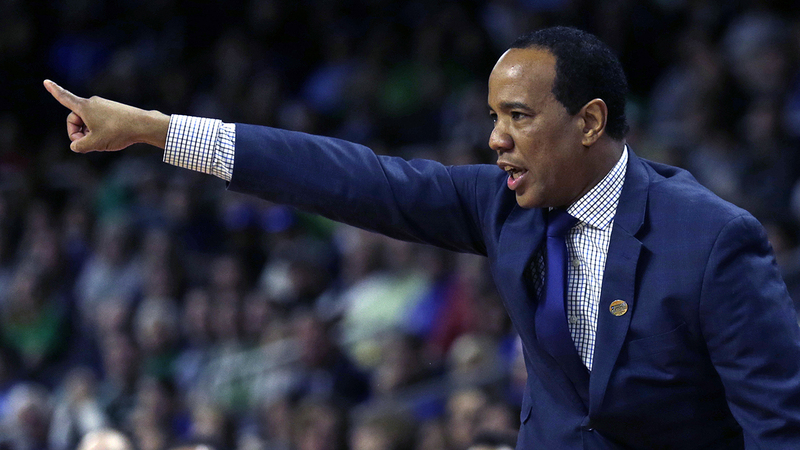 RALEIGH, North Carolina (WTVD) -- N.C. State has hired UNC-Wilmington's Kevin Keatts as men's basketball coach, replacing Mark Gottfried who was fired after six seasons at N.C. State. Keatts was interviewed Friday and accepted the job, multiple sources said. The University confirmed the hiring Friday night in a release. "When we set out to hire our next men's basketball coach, we wanted to identify someone with the pedigree, vision and plan to serve as the architect of NC State basketball," said Director of Athletics Debbie Yow. "Kevin quickly emerged as the perfect fit in each of these areas. His history of success in building programs, of competing at a championship-level in every stop of his career, his commitment to player development and priority in academics make him a tremendous hire for us. We welcome Kevin, his wife Georgette, and two sons K.J. and Kaden to the Wolfpack family." Keatts, 44, took over a UNC-Wilmington program that had gone eight seasons without a postseason appearance and quickly turned the Seahawks around, with three consecutive postseason appearances, including back-to-back NCAA tournament berths. Keatt's Seahawks lost a close game to Virginia 76-71 on Thursday in the opening round of this year's NCAA tournament. Last year, UNCW gave Duke fits before falling 93-85. "I have an incredible respect for the history and tradition of NC State University, and am honored by the opportunity to lead the Wolfpack," Keatts said. "There is an unbelievable commitment to basketball in Raleigh, and I share a vision with Debbie Yow and Chancellor Randy Woodson on what NC State can achieve. " Keatts, who was hired at UNCW in 2014, went 72-28 in three seasons. Before taking the job in Wilmington, he was a member of Rick Pitino's staff at Louisville, helping the Cardinals to a pair of Final Fours, a Sweet 16 and the 2013 NCAA title. He was the head coach at Hargrave Military Academy in Virginia from 2003 to 2011 before being hired by Pitino. He will replace Gottfried, who was fired after six seasons in Raleigh. Gottfried took the Wolfpack to the NCAA tournament in each of his first four seasons, but the program failed to live up to expectations the past two years and finished 13th in the ACC each season. "From incredible fan support to high-level academics, first-class facilities and the ability to recruit at the highest level, everything is in place at NC State to build an elite program," Keatts said. "My family and I are honored to become a part of Wolfpack Nation, and I look forward to adding to its storied history." A native of Lynchburg, Va., Keatts guided the Seahawks to CAA regular season titles all three years in Wilmington and was named CAA Coach of the Year in 2015 and 2016. He was the first coach in conference history to earn Coach of the Year accolades in back-to-back seasons. His 2016-17 UNC-Wilmington team won a school-record 29 games as the team led the conference and ranked 10th in the nation in scoring heading into the NCAA tournament, averaging 85.2 points per game. "We welcome Kevin and his family to the NC State community," said NC State Chancellor Randy Woodson. "We're confident he has the character, leadership and vision to lead our men's basketball program to great heights."